Added in some details - Broken addons (skillet) / customized addons (AtlasLoot). Special thanks to gnoppy for sharing the link. This will take a little time to go through all the Addons. Navigate to the "Interface\AddOns" folder. Extract the specific addons you wish to use inside the AddOns folder. List of each addon inside the pack and what they do. Library use - dependency type. "This addon provides 5 AceGUI-3.0 widgets that will make selection LibSharedMedia-3.0 types easier." "ACP adds the "Addons" button to the game's main menu"
"AddFriend is a simple addon that adds an Add Friend or Remove Friend and Guild options to the context menu of player options." 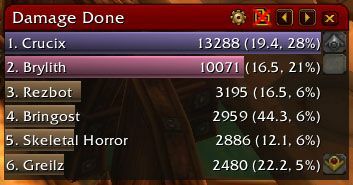 "This addon moves the functionality of the stat dropdowns to a panel on the right side of the paperdoll, so that you can see all of your stats at once. It also removes the dropdowns and resizes the paperdoll to the same size as the inspection window. A handy button hides the panel. Using a minimum of code, this addon only takes 10-20Kb of ram." "Aloft is an addon that allows you to customize and enchance how nameplates and nameplate casting bars appear in the game." Pretty obvious what this does, combines your bags into 1 visible window. I believe it works for Bank and anything else that uses bags. "AtlasLoot Enhanced is an UI mod allowing for loot tables of bosses to be browsed whenever needed within the game." "Bagnon is a highly customizable bag replacement addon designed to help the player find items as quickly and as easily as possible." "Bartender4 is a full ActionBar replacement mod. It provides you with all the features needed to fully customization most aspects of your action and related bars." "This addon makes the Blizzard windows movable." "Some shaded skins for various UIs." 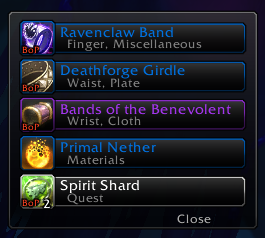 Enhancement Addon - Looks like it was removed by the original creator and shared elsewhere. Source shows pictures of each type of ButtonFacade. "A clean square or round minimap that replaces the default minimap. Cleans up default buttons and rearranges them. The minimap and buttons can be individually scaled and various portions of the map can be hidden. 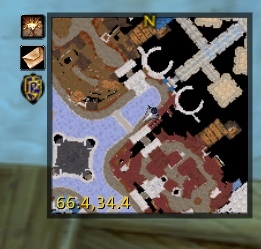 CleanMinimap uses the Rock library and can be configured through AddOn Preferences. Rock is included in the regular package." 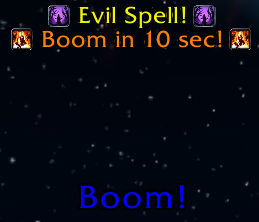 "This addon displays a large yellow number (and text for numbers > 60 seconds) on spell icons for action bars, bags, character sheet, and quest icons in the tracker. 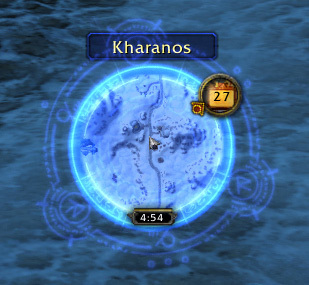 Font can be modified, and the cut-off for how long a cooldown needs to be in order to display on the button can also be changed. The number begins flashing when time remaining is less than 10 seconds." "Shows ZoneInfo on the World Map in a perfectly cromulent fashion." "Ever wanted to know when a certain ability will come off cooldown, but you're too caught up in a fight to notice? Doom_CooldownPulse is designed to fix that problem! It flashes the icon of the ability in the middle of your screen whenever it becomes usable again." Complete UI overhaul - may not work with everything. "ErrorMonster is a companion that throttles and redirects errors and system messages and information messages from the UI error frame to any other frame supported by LibSink2-0"
"Fontain is a simple Ace3 addon to give you a highly configurable set of controls over your UI's font choices." 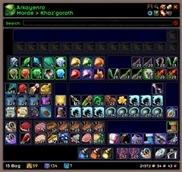 "Gatherer is an addon for herbalists, miners and treasure hunters in World of Warcraft. It's main purpose is to track the closest plants, deposits and treasure locations on your minimap." 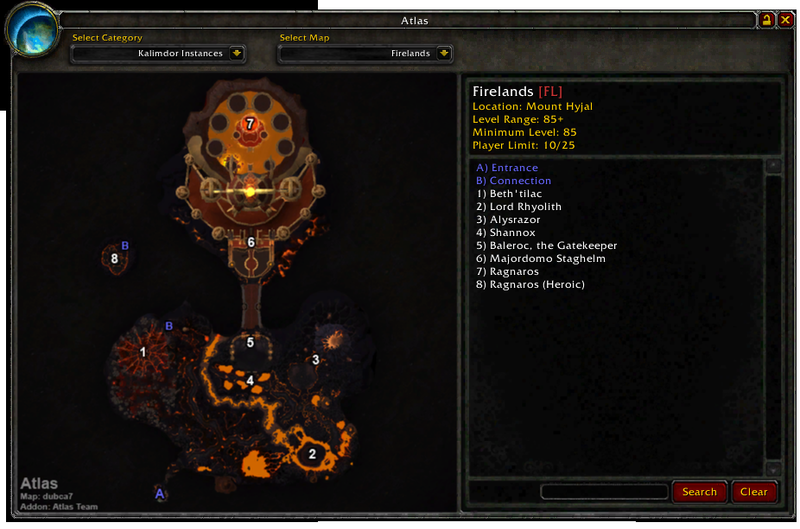 "This addon will provide you with all the information currently in the Wowhead database showing all known locations of herbs, minerals and treasures. Now you can simply load up Gatherer, plug this database into it, and know what can be found in the zone you are in, without having to discover them yourself." "Gear score is a numerical value based on the statistics of a player's gear. It is (supposedly) the maximum potential of a player's performance. However, it is up to the player to perform that well." No longer provided on CurseForge for this specific version. Unable to determine the exact game version supported. Also seems to be the "PlayerScore" rather then "GearScore" page. "The compact grid of unit frames lets you select a group member quickly, while keeping a good overview of the whole group. It shows as much information as possible without overloading you. It allows you to customize what information you see, and how you see it. It works in both party and raid groups, and supports pets and vehicles." "Handy Notes for your maps. This addon is intended to be a small and simple replacement for Cartographer_Notes and functions in a similar manner." "Create panels for customizing your UI, sucessor to eePanels"
"Shared handling of media data (fonts, sounds, textures, ...) between addons." "In general, DropCount tells you where stuff is. It's a repository for loot, quests, vendors, trainers, books, locations, ores, herbs, ratios, etc." Unknown Looks to be a "Crowd Control Alert" addon. Supported Game Versions - 6.1.0 ?? "This addon adds the "Pixel Unicode" font to SharedMedia so it can be used by other compatible addons. This font is best used at 16px or 32px." "This addon adds the "Silkscreen" font to SharedMedia so it can be used by other compatible addons. This font is best used at 8px or 16px." "This addon adds the "Visitor" font to SharedMedia so it can be used by other compatible addons. This font is best used at 10px or 20px." Enhancement Addon - Not just for mages! "Mage Nuggets is a utility with many useful nuggets to make the lives of mages easier." "Mapster is a very simple world map enhacement addon, which was designed to work in conjunction with all other map addons out there. The idea to create Mapster originated from pure lack of a simplistic addon that only modifies the world map, without adding a full scale feature set." "MSBT is designed to be an extremely lightweight, efficient, and highly configurable mod that makes it easier to see combat information by scrolling the information on the screen in separate, dynamically creatable scroll areas. It is a replacement for Blizzard's Floating Combat Text and Damage output." "Minimalist is a collection of miscellaneous UI tweaks and automations for building a minimal UI with minimal addons or using as the core of a compilation. Since I am using a very barebone laptop from time to time, I am planning to release an even more minimalistic version of Minimalist called Micromalist, stay tuned." "Omen is a threat meter. 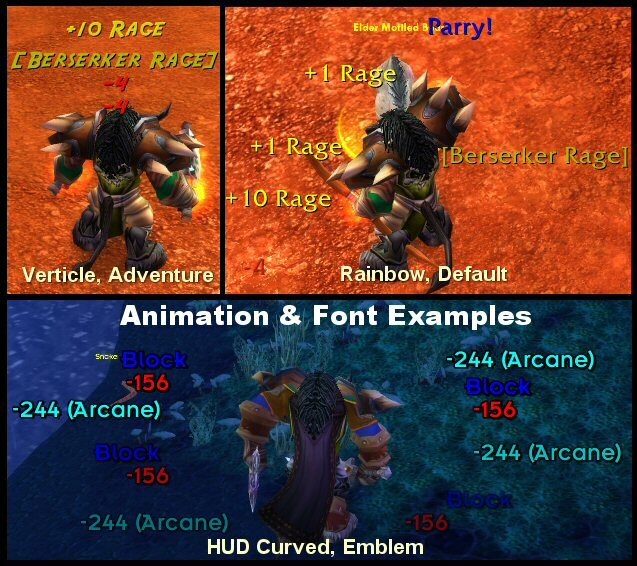 Basically, enemies in WoW decide who to attack by deciding who is the most threatening based on the abilities you use. What Omen does is provide accurate values of your group's relative threat level on individual enemies, so that you can see when you're in danger of pulling aggro (or, if you're next on the snack list if your tank bites it). This info is usually only critical in raids, where only tanks can survive aggro, but it's useful for any multi-player situation." "Outfitter is an equipment management addon which gives you fast access to multiple outfits to optimize your abilities in PvE and PvP, automated equip and unequip for convenience doing a variety of activities, or to enhance role-playing." "Prat-3.0 is a chat enhancement addon for world of warcraft 3.0.It is made up of 30+ smaller "modules" which each provide additional functionality, and can be enabled or disabled individually. In game, type /prat for a menu. Or use the icon on one of the many data broker hosts"
"Quartz is a modular approach to a casting bar addon." "Recount is a graphical damage meter written by Cryect." "A mod that adds your damage to SCT. It provides a way for you to see your damage in a static location. This can be useful against large mobs like those in MC, Bosses, etc...Can use SCT animations or its on built in style." "A fairly simple but very configurable mod that adds damage, heals, and events (dodge, parry, windfury, etc...) as scrolling text above you character model, much like what already happens above your target. This makes it so you do not have to watch (or use) your regular combat chat window and gives it a "Final Fantasy" feel." "Inserts more than 25 additional fonts into LibSharedMedia's storage"
"Inserts media(fonts, bars, borders, etc) into LibSharedMedia's storage. They can then be selected by any addon that supports LibSharedMedia, a lot of them do." Skillet-r167 -- Broken do not use. "Skillet is a replacement for the default tradeskill and craft UI." 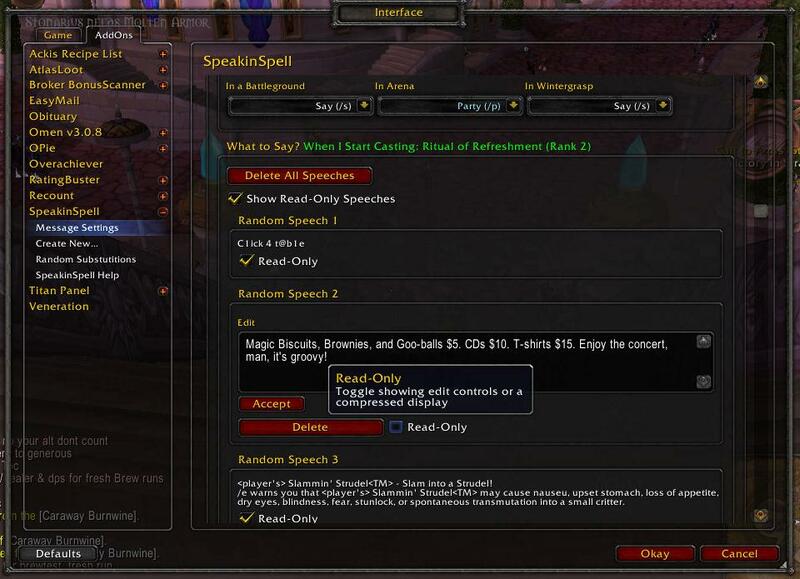 "Funny and/or Useful, SpeakinSpell will use random speeches in chat to announce when you use spells and other abilities, as well as items, procced effects, other events, and user-defined macros. Works with all classes. Configurable for many different situations." 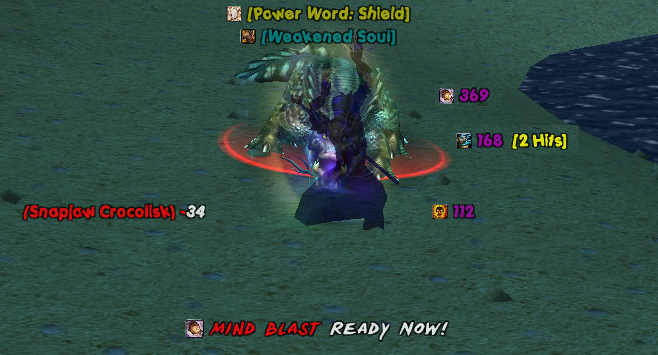 "Tidy Plates enhances World of Warcraft's nameplates." "TomTom is your personal navigation assistant in World of Warcraft. This addon is very simple, but provides a nice set of functionality. 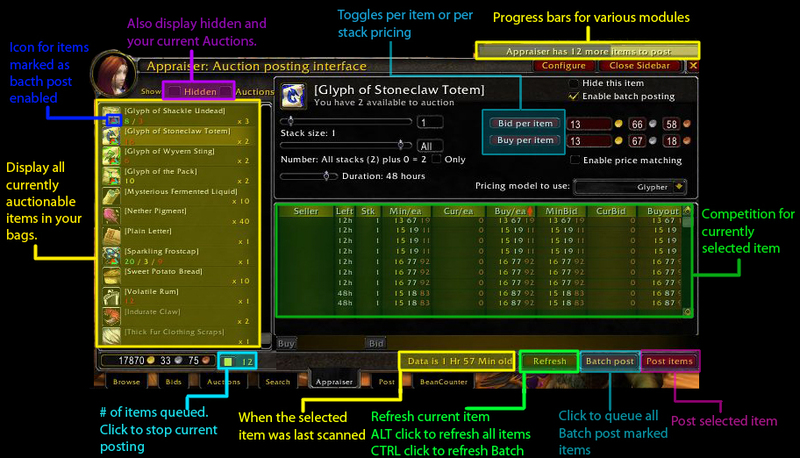 Thanks to Esamynn for Astrolabe, which does the bulk of the work in this addon." "WIM (WoW Instant Messenger) is a World of Warcraft addon which brings an instant messenger feel to communication in game." 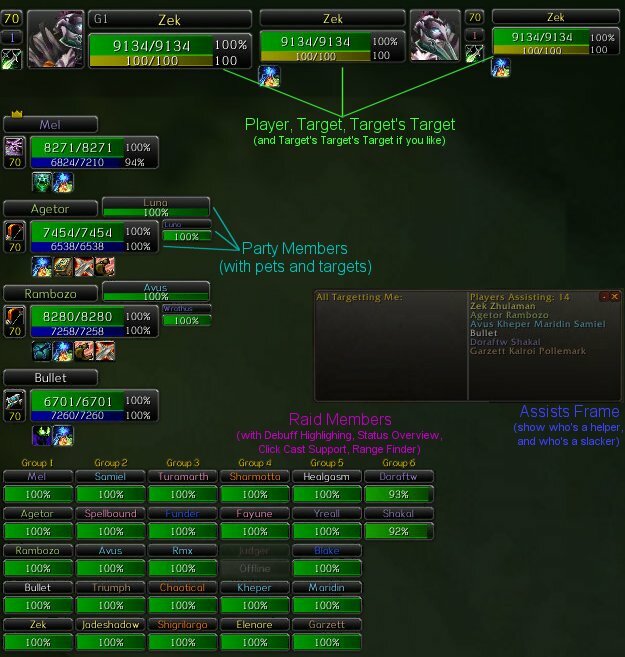 "XLoot is a group of addons which improve looting in WoW by replacing default frames." "Perl, with Extra stuff. Much enchanced from Nymbia's Perl UnitFrames, and a complete replacement for Blizzard's default unit frames, including raid frames and raid tools, with little remaining of the original Nymbia code." Finished sorting it all out. Some are Library's designed for other addons, some are UI Addons so you don't want to install all of them, just ones you want. There's also a few other specific type addons like minimap/map and crafting and so on.